from commissioner Ron Robison in March. the OHL’s Owen Sound Attack.Bob McGill was presented with a WHL Distinguished Service Award in March prior to a game between the host Edmonton Oil Kings and the Red Deer Rebels.McGill scouted for various WHL teams for more than 25 years.He worked for the Lethbridge Hurricanes, Medicine Hat Tigers, Kelowna Rockets, Vancouver Giants and the Oil Kings.During his 10 seasons with the Rockets, they won two WHL titles and made three Memorial Cup appearances, winning it all as the host team in 2004.He joined the Oil Kings for their inaugural season (2007-08) and was with them through 2014 when they won the Ed Chynoweth Cup and the Memorial Cup. 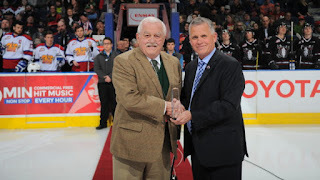 He retired after that season, going out on top.He had played for the original Oil Kings before joining the Edmonton Fire Department, where he would spend 30 years.McGill, known by all as Gilly, was extremely popular on the coaching circuit and among his peers. —— The Regina Pats went 3-3-1 in the exhibition season and will open the real season on Friday against the visiting Prince Albert Raiders. Greg Harder of the Regina Leader-Post reports that F Luc Smith (charleyhorse) and D Lane Zablocki (shoulder), who didn’t play in a 6-4 loss to the visiting Brandon Wheat Kings on Saturday, should be ready, but D Brady Pouteau (ankle) isn’t expected to be back. . . . Regina got down to two goaltenders by dropping Kurtis Chapman from their roster. He is expected to report to the SJHL’s Estevan Bruins. Chapman, 18, is from Airdrie, Alta. He was a seventh-round pick in the 2013 bantam draft. His departure leaves the Pats with Tyler Brown, 19, and Jordan Hollett, 17, as their goaltenders. Brown got into 50 games last season (21-19-6, 3.15, .909), while Hollett made 23 appearances (10-6-1, 3.67, .887).—— The Vancouver Giants are preparing for their first season in the Langley Events Centre after moving over from the Pacific Coliseum. Peter Toigo, the Giants’ vice-president, operations, has told Steve Ewen of the Vancouver Province that the team may limit tickets sales to “about 4,500” per game, at least in the early going. The LEC has a listed hockey capacity of 5,276, which includes 700 standing room. The Giants may not sell standing room. According to Ewen, Toigo told him that the Giants want to make sure they have the fan experience nailed down. They want make sure the building and staff can handle the crowd. . . . Toigo also told Ewen that season-ticket sales are up for the first time since 2006-07, although he wasn’t able to supply an exact figure.